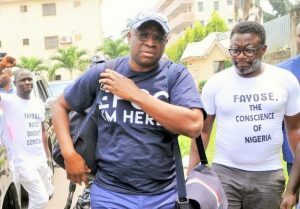 By Sadiq Umar – Former Ekiti State governor, Ayodele Fayose, has regained freedom, after fulfilling his bail condition. Mr. Fayose’s spokesperson, Lere Olayinka, confirmed his release from the custody of the Economic and Financial Crimes Commission (EFCC) it a tweet on Monday. “Fayose just regained his freedom. He left the Federal High Court, Ikoyi a few minutes ago. We will meet @officialEFCC at the court from November 19. Thank you, Nigerians,” Mr. Olayinka wrote. The former Ekiti governor was granted a N50 million bail last Friday but failed to meet the conditions. Mr. Fayose was arraigned at a High Court in Lagos after he reported to the EFCC office in Abuja for interrogation. He was accused of unlawfully receiving ₦1.2 billion money to fund his 2014 gubernatorial campaign in Ekiti State.